SolSustainable began with an interest and passion for solar energy. We are an architectural design firm who wanted to venture and understand the options that were available for the architectural industry in terms of sustainability, energy efficiency and renewable energy. We were first interested in sourcing the latest in Italian design and manufacturing. We wanted unique 8mm solar tiles that are made from a ceramic surface. 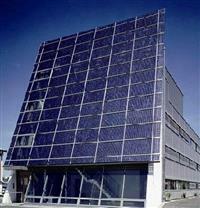 This unique innovative product included the option of cladding the vertical surface of a Building with ceramic solar tiles. The simple concept was that solar tiles could not only on the roof but also on the sides for maximum practicality. This solution was designed for for maximum use of renewable energy. This concept is what began Sol Sustainable Designs and it was further developed to sourcing Building Integrated Photovoltaics (BIPV) that could be introduced to the Australasion market. Coloured Solar Cells, Solar Glass and Solar Cladding just to name a few. Please use the Contact form on the right for Innovators of Building Integrated Photovoltaics information and ordering. Your message will be sent to Sol Sustainable Designs only. Privacy & Anti Spam protected.